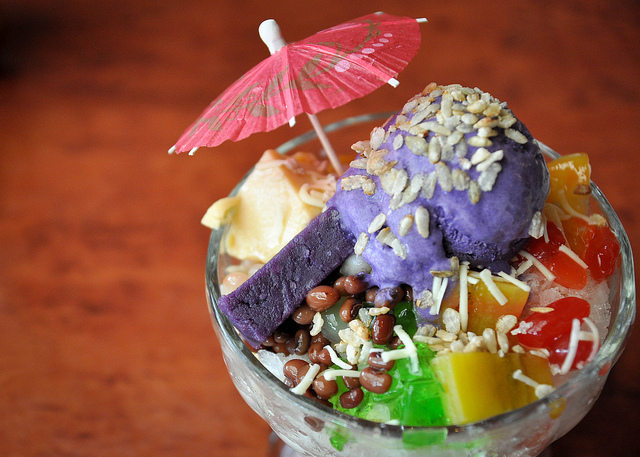 Halo halo is a famous Filipino dessert alternative to ice cream and their kinds. “Halo” means “mix” in the Filipino dialect. As to how we eat it? Commonly, we eat it by mixing and stirring all the ingredients together til the ice blends with them. To make halo-halo, Filipinos mix shaved ice; sugar; varied sweetened fruits like beans, garbanzos, sugar palm fruit, sweet potato, silky coconut, banana-like plantain, corn, mung beans, and jackfruit; and other ingredients like coconut gelatin, agar-agar gelatin, and tapioca pearls.The whole concoction is then topped off with leche flan, haleya ube, sorbetes, pounded crushed young rice, and evaporated milk. 1. In a tall glass, bowl, or emptied coconut shell, add in sugar. 2. Add each of the sweetened ingredients one at a time, taking care to layer them one on top of the other. Add cooked Sago and Macapuno. 3. Top with shaved ice. 4. Place leche flan, ube, Ice Cream, and Sweetened Langka or Jackfruit on top of shaved ice. 5. Pour evaporated milk into the mixture according to your desired creaminess.